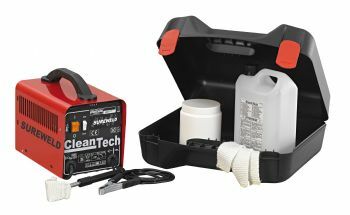 Easily clean away the MIG, TIG or even Spot weld discolouration. Cleantech eliminates completely all the colouring and oxidation effects that are produced in the weld area. Kit complete with 230 volt power source, earth connection, wand with 10 pieces of liquid application tape, 3 litre of liquid and a liquid dispensing container. Simply connect the earth clamp to the work piece, dip the tape end of the wand into the liquid and wipe the weld area clean. Wash component with water after use.